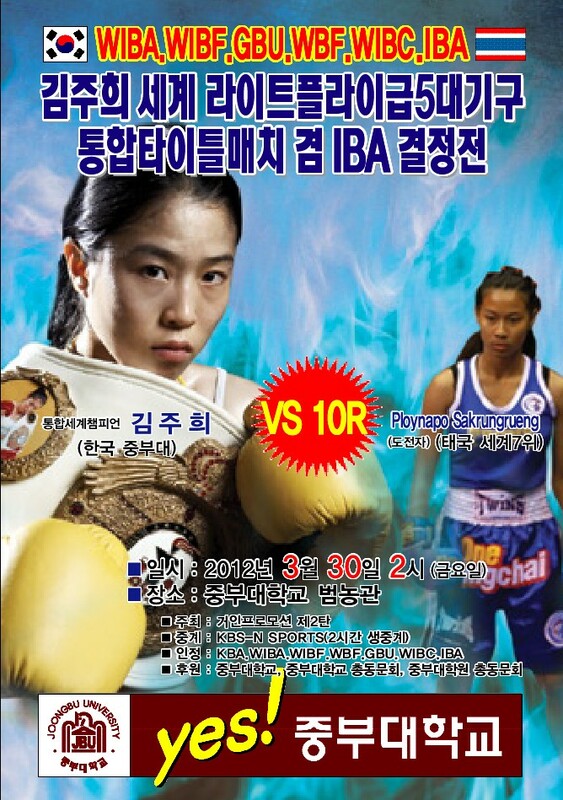 South Koreas World Boxing Federation Women’s World Light Flyweight Champion Ju Hi Kim is set to make her second title-defense on Friday March 30 in hometown Seoul, taking on tough challenger Ploynapa Sakrungrueng from Thailand. 26-year-old Kim, 15-1-1 (6), won the WBF World title in September 2010 when she outpointed Jujeath Nagaowa from the Philippines, and successfully defended it last July with a unanimous decision over another Thai, Fahpratan Looksaikongdin. Ploynapa Sakrungrueng, 5-1 (0), turned professional at seventeen in 2010 after an extensive Muay Thai career, and amazingly fought for her first title in only her second bout, losing a decision to another Korean, Yeon-Hee Kim, for a regional strap. Since then she has racked up four straight victories, and at 19 years old has the advantage of youth on her side. WBF President Howard Goldberg will be ringside for the fight, and the South African is certain it will be well worth the long flight from Cape Town, saying: I was in South Korea for Kim’s first title defense, and it was a fantastic fight. She is a very entertaining fighter, and when you pair that with the fact that Sakrungrueng is an immensely talented up-and-coming boxer I think we are in for a treat once again. Besides the WBF World title, Ju Hi Kim has also captured a host of other championships since her debut in 2001 at only fifteen years of age, some of which will also be on the line against Sakrungrueng. A sell-out crowd is expected to cheer on the national sporting hero as she attempts to continue her impressive reign as queen of the Light Flyweights.